When I started a Blogger blog back in May of 2008 I never imagined where writing and creating online could take me. Before that online journaling had been limited to a “Dear Diary” style Livejournal that I sporadically kept through late high school and college. My content was limited to fretting over what hair style I should rock next, and only a handful of friends had access to my clearly relevant musings. So I was perfectly content finding my voice in my Blogspot every single day, sometimes twice a day, for a few years with only 32 “followers”. And then I got my first comment from a stranger. I was completely flabbergasted and felt like I had arrived. In fact, the commenter was Jen from Rambling Renovators – she quickly went from stranger to blog buddy and now someone I consider a real-life friend. I soon thereafter realized there was an entire community of like-minded bloggers out there and I became more active in the blog world. Slowly my “followers” increased from the 30s to the 100s. My family was super impressed by my online fame as I continued to receive more comments from people who weren’t my immediate friends and family. After my first time to attend the Alt Summit design blogger conference I became more aware of metrics and analytics. Analyzing traffic became “a thing” that was especially important for legit bloggers who wanted advertisers and sponsors. So I installed Google Analytics on my blog and quickly became numbers obsessed. Soon no number was never enough. I wanted more. The validation I received from blogging no longer came solely from my own creative expression but from the number of RSS subscribers I had in my Feedburner. Even as the numbers of my blog readers increased to the 1000s I would still find myself with hurt feelings if I woke up to 1,348 followers when the day before I had 1,349 people reading along. I became obsessed with tracking my traffic – the numbers turned into an addiction. Enough was enough. 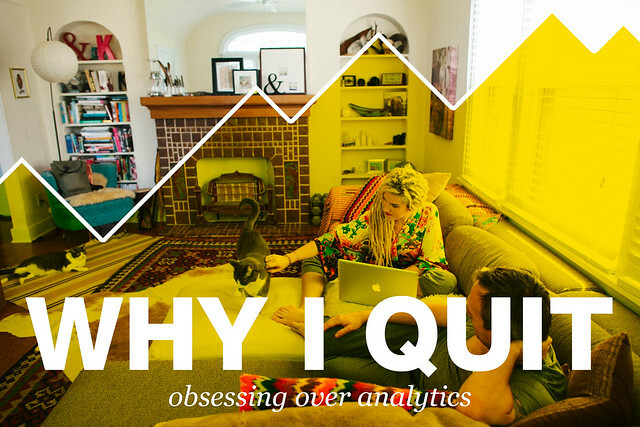 When I switched from my Google Blogger to WordPress I quit reading my analytics. Because meaningful connections and conversations are more important than metrics. Because I’m more interested in generating content I’m proud to hit “publish” on vs. hitting an arbitrary amount of monthly page views. Because I’m far more concerned with exploring, experimenting, and wholehearted searching with my soul than I am with my SEO. Regardless of whether I have 1, 100, 500, or 150,000 people reading my blog the purpose of capturing, shaping, and sharing not only who I am but who I aspire to be, in my little corner of the internet will remain the same. For me blogging is not a numbers game – rather it’s a valuable tool for creative expression, exploring new ideas, and creating community. Analytics are really important for bloggers who are compensated for their content with sponsors and advertisers. But for me, it’s not the number of page views that pays my bills but individual readers who support the work I do by either hiring me for coaching or branding or buying the content I create here and here (which is why I will continue to promote it here in this space). But even when there is never an exchange of services or product, I’m more than compensated by conversations, connection, and creative articulation – and those things can’t be measured by metrics.